The National Oceanic and Atmospheric Administration (NOAA) charts show a huge amount of polar air moving across the USA. The winds are set to send temperatures across the central and northeastern USA plunging to below freezing. "Powerful" Arctic winds are threatening to sweep the states of Philadelphia, Washington, New York and Pennsylvania unleashing "blinding snow squalls". Thermometers will plunge up to 25C below normal for the time of the year while a "lake effect" will bring torrents of snow. Here’s what a spokesman for US meteorological service Vencore Weather said: "A powerful cold front will arrive with gusty winds on Thursday night and usher in an Arctic blast for Friday and Saturday with the lowest temperatures of the season so far". "An overall upper-atmosphere pattern with high-latitude blocking is looking increasingly likely for later this month and that could result in more cold air outbreaks in the Mid-Atlantic region by the time Thanksgiving week rolls around." "Cold air pushed in overnight from the northwest and it has already become cold enough in upstate Pennsylvania for the snow to fall." "As the low pressure slides off the coast later today and tonight, it could actually become cold enough just to the north and west of the big cities for some sleet or snow to mix in." According to the National Weather Service, snow squalls, that kill more people than tornadoes, will finally get its own weather warning. 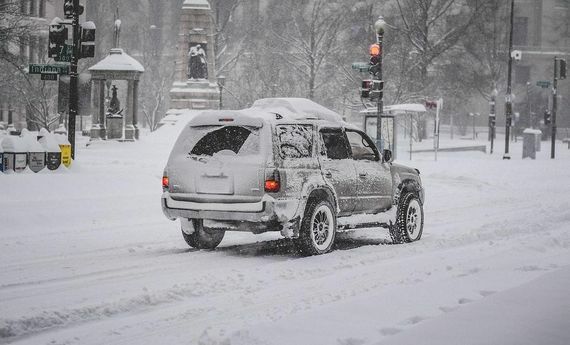 This new "snow squall warning" will convey the danger travelers face from an extreme reduction in visibility during short-term bursts of heavy snow. National Weather Service meteorologist David Soroka stated: "It can be sunny one minute, then blinding snow for 30 months, then back to sunny again." Amid the warnings, AccuWeather forecaster Alex Sosnowski urged those in the firing line to make their homes winter ready. Here’s what he said: "The first Arctic blast of the season will drop out of Canada and sweep quickly eastward from the Upper Midwest to New England during the second half of this week. "The main thrust of the Arctic air will extend from the Dakotas and Minnesota to Wisconsin, Michigan, upstate New York, Vermont, New Hampshire and Maine. "Property owners who have not done so already should drain garden hoses and fountains and bring bird baths in for the season."